Spirit’s flagship, and largest yacht built to date, is the thoroughbred 100’ Gaia. As demand for Spirit superyachts increases, resulting in the recent release of designs for a new 118’ sailing yacht, we take a closer look at what makes Gaia such an icon. 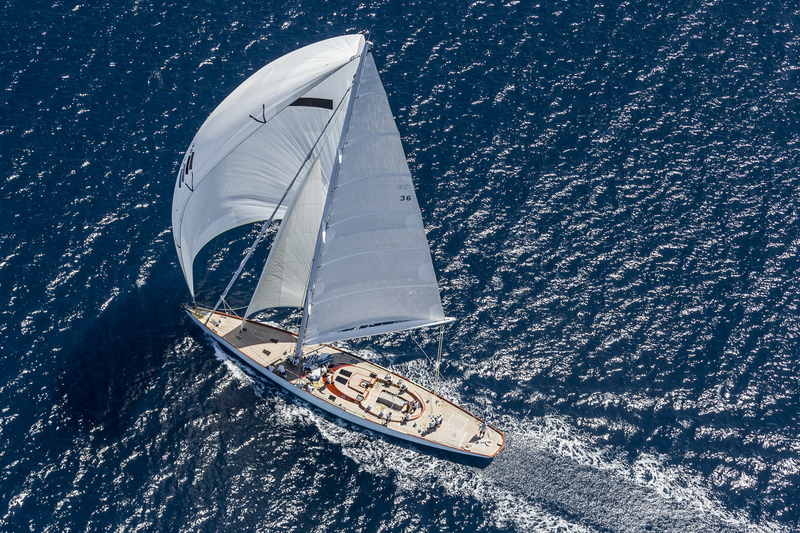 Keen superyacht fans may have recently spotted Gaia on the race circuits at the Loro Piana and Superyacht Cup regattas and with plans for cruising in Croatia and the Balaerics this summer, Gaia embodies the essence of a Spirit yacht built for racing as well as relaxed family sailing. In terms of competing, at 48 tonnes she has an impressive strength to weight ratio for a yacht of her size. With North 3DL sails, Nordic carbon mast with BSI nitronic rod rigging, carbon rudder, full stainless steel 2 speed electric self-tailing Anderson winches and custom deck gear by Hercules, she has certainly been built for performance. Gaia is as elegant down below as she is above deck, with four sky lights from the coach roof flooding the area at the bottom of the companionway with natural light. An owner’s cabin with two large beds, dressing table and en suite shower, and two guest cabins sharing an en suite shower comprise the guest accommodation, with additional skipper’s cabin and crew cabin. A well equipped galley on the port side leads into a central saloon area with tan leather sofa and dining table, complemented by a discreet flat screen TV and surround sound music system throughout the yacht. Spirit Yachts is faced with the common perception that whilst its modern classic yachts perform on the regatta circuit and are without doubt beautiful, surely the varnish means excessive maintenance? To find out more about Spirit superyachts, please contact Nigel Stuart via email [email protected] or phone +44 (0) 1473 214715.